"Half-Life 3 is coming! I can't wait!" Sound familiar? It should, because the collective internet has been reacting with unbridled anticipation toward the sci-fi sequel since it was announced in 2006. 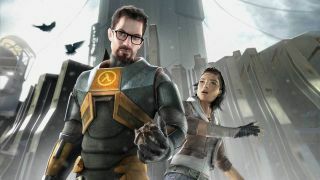 That's right, we've been waiting for the conclusion to Gordon Freeman's story for a decade. Let that sink in a bit. Now let it sink in more. More. And if you need some help processing your emotions, watch this video compilation of Valve head Gabe Newell talking about its development, slowly progressing from a "definitely coming out soon" vibe to "it's in development" and finally, "I have nothing to say about Half-Life 3." If you're looking for a silver lining, Valve's own Team Fortress 2 likewise took an extensive detour during development, releasing eight years after its reveal. And hey, Half-Life 3 still has a long time before it catches up to Duke Nukem Forever, which took a staggering 15 years to complete. With the revival of dead-in-the-water games like The Last Guardian and Shenmue 3, maybe this will finally be the year, huh?